DALLAS — Colorado’s Mike MacIntyre, whose Buffaloes claimed the Pac-12 South Division title and completed one of the best turnarounds in college football this season, has been named the 60th annual FWAA/Eddie Robinson Coach of the Year. 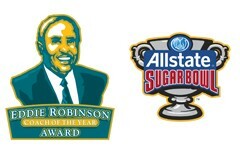 Presented for a third straight year by the Allstate Sugar Bowl, the FWAA/Eddie Robinson Coach of the Year Award honors the top coach in the FBS as selected by the membership of the 76-year-old writers’ organization. The FWAA/Eddie Robinson Coach of the Year Award will be highlighted during a reception beginning at 5:30 p.m. ET on Jan. 7, 2017, in Tampa in conjunction with the College Football Playoff National Championship. 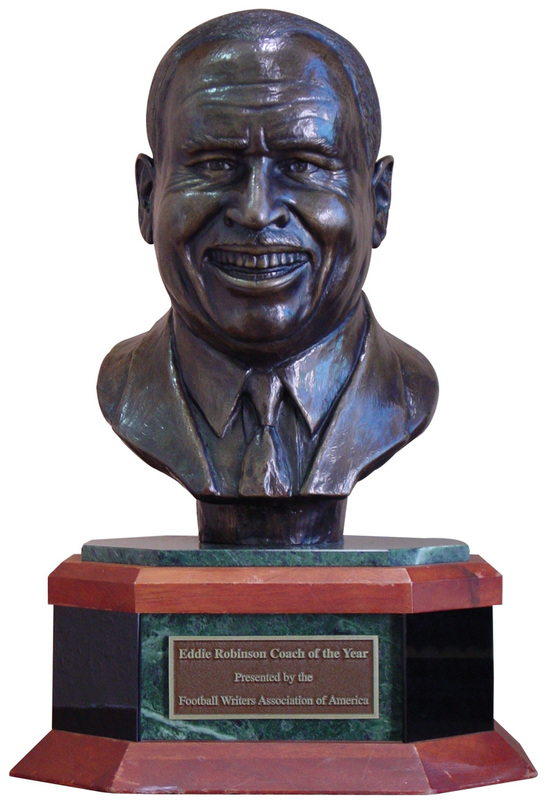 MacIntyre will accept the Eddie Robinson bust at Jackson’s Waterfront Room, near the championship game media hotel. MacIntyre is the second Colorado coach to win the award after Bill McCartney in 1989. MacIntrye, 51, fashioned an FBS-best six-game turnaround (tied with Central Florida) after a 4-9 record in 2015. The Buffaloes (10-3) did it behind a stellar defense that has allowed just 20.2 points per game. Colorado, which was picked to finish last in its division before the season, will make its first bowl appearance since 2007 in the Valero Alamo Bowl vs. Oklahoma State on Dec. 29 in San Antonio. MacIntyre is just the second Pac-12 coach to win the award since 1997. Oregon’s Chip Kelly earned the honor in the 2010 season. Previously, MacIntyre, now in his fourth season with the Buffaloes, was head coach at San Jose State, where he turned around that program before heading to Colorado. The son of former Vanderbilt head coach, the late George MacIntyre, Mike MacIntyre has a coaching resume dotted with several assistant coaching stops, including the Dallas Cowboys and New York Jets in the NFL. The entire FWAA membership had the opportunity to vote on the Coach of the Year Award, which was narrowed to five finalists earlier this month. The other finalists were Western Michigan’s P.J. Fleck, Penn State’s James Franklin, Washington’s Chris Petersen and Alabama’s Nick Saban. The Eddie Robinson Museum is open in his honor in Grambling, Louisiana where numerous memorabilia reside, including another bust of the Eddie Robinson Coach of the Year Award. The Allstate Sugar Bowl has established itself as one of the premier college football bowl games, having hosted 27 national champions, 88 Hall of Fame players, 47 Hall of Fame coaches and 17 Heisman Trophy winners in its 82-year history. The 83rd Allstate Sugar Bowl Football Classic, featuring teams from the Big 12 and the SEC, will be played on January 2, 2017. In addition to football, the Sugar Bowl Committee annually invests over $1.3 million into the community through the hosting and sponsorship of sporting events, awards and clinics. Through these efforts, the organization supports and honors over 25,000 student-athletes each year, while injecting over $2.5 billion into the local economy in the last decade. For more information, visit www.AllstateSugarBowl.org. The Eddie Robinson Award is a member of the National College Football Awards Association (NCFAA) which encompasses the most prestigious awards in college football. The 22 awards boast more than 700 years of tradition-selection excellence. Visit ncfaa.org to learn more about our story. If you catch 16-year-old Chloe Robinson just kickin’ it on a Friday night, chances are it’s through the uprights on a football field. She is the placekicker for Benjamin E. Mays High School in Atlanta, which is in the quarterfinals of the Georgia 5A playoffs. Chloe is a junior at Mays, and this is her football debut this season. She is the only girl listed on any high school football roster in Atlanta Public Schools. Editor’s note: Chloe also is the great-granddaughter of the late Grambling coach Eddie Robinson, the namesake of the Football Writers Association of America’s Coach of the Year Award. This year’s finalists for the award will be announced on the morning of Dec. 6 at the Waldorf-Astoria in New York. The winner will be revealed on Dec.15 in Dallas, and the presentation of the Eddie Robinson Bust to the winning coach will occur on Jan. 7 in Tampa during a reception two days before the CFP National Championship Game. CLICK HERE to read the entire story at theundefeated.com. These photos were taken at a reception honoring Iowa’s Kirk Ferentz as winner of the FWAA’s Eddie Robinson Coach of the Year Award. The reception took place at the J.W. Marriott in Scottsdale, Ariz., on Jan. 9, 2016. Iowa Coach Kirk Ferentz, winner of the Eddie Robinson Coach of the Year Award, shakes hands with Eddie Robinson III, grandson of the award’s namesake, at a reception on Jan. 9 in Scottsdale, Ariz. Photo by Melissa Macatee. National Football Foundation President and CEO Steve Hatchell, FWAA member Andy Bagnato and Sugar Bowl COO Jeff Hundley at the Eddie Robinson Coach of the Year reception on Jan. 9 in Scottsdale, Ariz. Photo by Melissa Macatee. From left Eddie III, his daughter Chloe and son Eddie IV at the Eddie Robinson Coach of the Year reception on Jan. 9 in Scottsdale, Ariz. Photo by Melissa Macatee. Sugar Bowl COO Jeff Hundley and Iowa coach Kirk Coach Ferentz at the Eddie Robinson Coach of the Year reception on Jan. 9 in Scottsdale, Ariz. Photo by Melissa Macatee. Iowa Coach Kirk Ferentz, winner of the Eddie Robinson Coach of the Year Award, shakes hands with Sugar Bowl CEO Paul Hoolahan. Photo by Melissa Macatee. From left: Sugar Bowl President Carey Wicker, Eddie Robinson III, Iowa Coach Kirk Ferentz and 2015 FWAA President Lee Barfknecht at a reception honoring Ferentz as the winner of the Eddie Robinson Coach of the Year Award. Photo by Melissa Macatee. Mary Ferentz, wife of Iowa Coach Kirk Ferentz, winner of the Eddie Robinson Coach of the Year Award. Photo by Melissa Macatee. Iowa Coach Kirk Ferentz speaks as Eddie Robinson III (left) and 2015 FWAA President Lee Barfknecht watch on Jan. 9 in Scottsdale, Ariz. Photo by Melissa Macatee. 2015 FWAA President Lee Barfknecht introduces Iowa Coach Kirk Ferentz at a reception for the Eddie Robinson Coach of the Year Award on Jan. 9 in Scottsdale, Ariz. Photo by Melissa Macatee. FWAA Incoming President Mark Anderson (left) and FWAA member Tim Simmons at the Eddie Robinson Coach of the Year reception on Jan. 9 in Scottsdale, Ariz. Photo by Melissa Macatee. Sugar Bowl President Carey Wicker (left), FWAA 2015 President Lee Barfknecht and Iowa Coach Kirk Ferentz listen to a speaker at the reception honoring Ferentz as the Eddie Robinson Coach of the Year Award on Jan. 9 in Scottsdale, Ariz. Photo by Melissa Macatee. Iowa Coach Kirk Ferentz, winner of the Eddie Robinson Coach of the Year Award, talks with reporters at a reception in his honor on Jan. 9 in Scottsdale, Ariz. Photo by Melissa Macatee. The FWAA’s Eddie Robinson Coach of the Year Award. Photo by Melissa Macatee. Ted Gangi of I-30 East (left) and John McElwain of the Sun Belt Conference at the Eddie Robinson Coach of the Year reception. Photo by Melissa Macatee. Hall of Famer Pat McInally (center), with his son Jack (left) and John Sudsbury of the Allstate Sugar Bowl at the Eddie Robinson Coach of the Year reception. Photo by Melissa Macatee. 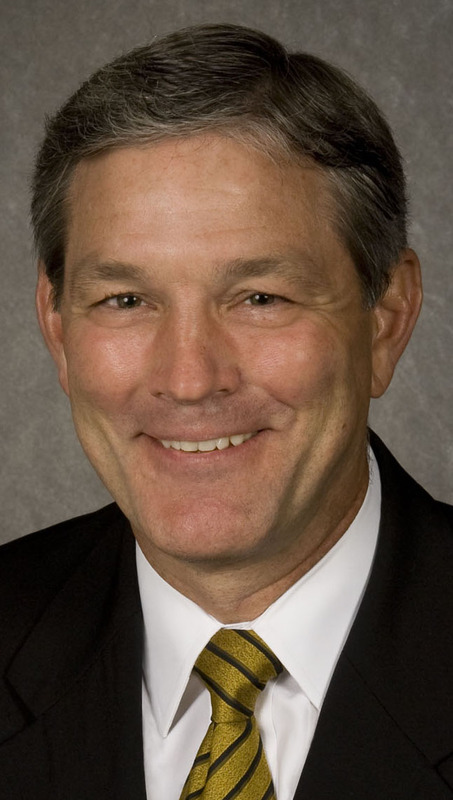 DALLAS – Kirk Ferentz, whose Iowa Hawkeyes won 12 games in a season for the first time in school history, has been named the first University of Iowa coach to win the 59th FWAA/Eddie Robinson Coach of the Year Award, it was announced on Wednesday by the Football Writers Association of America. Presented for a second straight year by the Allstate Sugar Bowl, the FWAA/Eddie Robinson Coach of the Year Award honors the top coach in the Football Bowl Subdivision as selected by the membership of the 75-year-old organization. Ferentz’s team had a 7-6 record in 2014 and was selected fourth in a preseason 2015 Big Ten West Division media poll. But the Hawkeyes won their first 12 games in 2015 before falling to Michigan State, 16-13, in the Big Ten championship game. For the first time since the 1990 season, the Hawkeyes will play in the Rose Bowl and face Pac-12 champion Stanford. 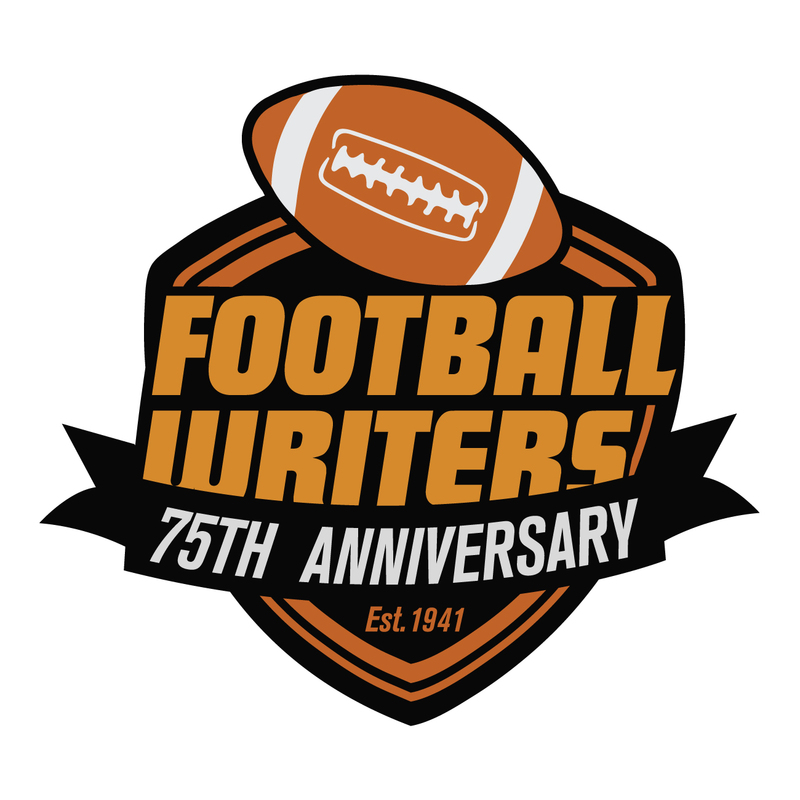 The FWAA/Eddie Robinson Coach of the Year Award will be highlighted during a reception on Jan. 9, 2016, at the JW Marriott Scottsdale Camelback Inn Resort and Spa. Ferentz will accept the Eddie Robinson Award bust at the College Football Playoff National Championship media hotel. Ferentz, 60, is in his 17th year at Iowa and has a 127-86 overall record in Iowa City. The dean of the current Big Ten coaches trails only Hayden Fry in terms of longevity as the Iowa head football coach. He has guided Iowa to 13 bowl games in 17 seasons. Ferentz has twice before been a finalist for the FWAA coaching award, in 2002 and ’04. But the last Big Ten Conference coach to win it was Ohio State’s Jim Tressel in 2002, the year the Buckeyes won the national championship in the Fiesta Bowl with an overtime victory over Miami. DALLAS — Even with their football season over, Gary Patterson and TCU continue to score points. Patterson accepted the Eddie Robinson Coach of the Year Award from the Football Writers Association of America on Saturday night at the Renaissance Hotel, headquarters for the national championship game. It gave him a chance, since a national media audience was asking, to talk about why he took the “high road” and avoided politicking for a spot in the four-team playoff or complaining when the one-loss Horned Frogs were left out. Click here to read the entire story by Carlos Mendez of the Fort Worth Star-Telegram. TCU Coach Gary Patterson received the FWAA Eddie Robinson Coach of the Year Award on Saturday Jan. 10 in Dallas. Photos by Melissa Macatee. Eddie Robinson III, TCU Coach Gary Patterson, former Notre Dame Coach Lou Holtz, 2014 FWAA President Kirk Bohls and Sugar Bowl President Judge Dennis Waldron pose with the FWAA Eddie Robinson Coach of the Year Trophy. Patterson received the award on Jan. 10, 2015, in Dallas. FWAA Eddie Robinson Coach of the Year Award winner Gary Patterson of TCU, his wife, Kelsey, and former Notre Dame coach Lou Holtz, a two-time winner of the Award, pose with the trophy on Jan. 10, 2015, in Dallas. Eddie Robinson III, FWAA Coach of the Year Gary Patterson of TCU, Patterson’s wife, Kelsey, former Notre Dame Coach Lou Holtz, FWAA 2014 President Kirk Bohls and Allstate Sugar Bowl President Judge Dennis Waldron. FWAA Eddie Robinson Coach of the Year Gary Patterson of TCU, Big 12 Commissioner Bob Bowlsby and former Notre Dame Coach Lou Holtz, a two-time winner of the coach of the year award. Allstate Sugar Bowl President Judge Dennis Waldron and Sugar Bowl CEO Paul Hoolahan at the FWAA Coach of the Year reception. Allstate Sugar Bowl President Dennis Waldron chats with Eddie Robinson III at the reception for the Coach of the Year Award. Jeff Hundley of the Allstate Sugar Bowl and Andy Bagnato of Bagnato Pflipsen Communications. Eddie Robinson’s great-grandchildren, Chloe Robinson and Eddie Robinson IV. The FWAA Eddie Robinson Coach of the Year Award. FWAA Eddie Robinson Coach of the Year Gary Patterson of TCU and former Notre Dame Coach Lou Holtz, a two-time winner of the award. Melissa Macatee photo. 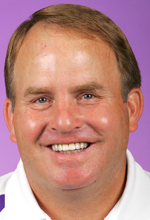 DALLAS – Texas Christian University’s Gary Patterson has been named the winner of the 2014 FWAA/Eddie Robinson Coach of the Year Award in the first year of the Allstate Sugar Bowl’s presenting sponsorship. Patterson is the eighth coach to claim the writers’ award at least twice. Two-time winners are Nick Saban (LSU, Alabama), Lou Holtz (Arkansas, Notre Dame), Darrell Royal (Texas), John McKay (USC) and Johnny Majors (Pittsburgh) as two-time winners of the 58-year-old National Coach of the Year Award. Woody Hayes (Ohio State) and Joe Paterno (Penn State) each won the award three times. Patterson’s 2014 TCU team, after being picked to finish seventh by the media before the season, claimed a share of the Big 12 Conference football title in only its third season in the league. Rebounding from a 4-8 record in the 2013 season, the Horned Frogs (11-1 overall, 8-1 in the Big 12) finished sixth in the final College Football Playoff rankings. TCU will meet No. 9 Ole Miss in the Chick-fil-A Peach Bowl on Dec. 31 in Atlanta. The Eddie Robinson Coach of the Year Award will be highlighted during a reception at the Renaissance Hotel on Jan. 10, 2015, in Dallas, where Patterson will accept the Eddie Robinson bust at the College Football Playoff National Championship Game media hotel. He will place it alongside the bust he won five seasons ago. Patterson, in his 14th season as the Horned Frogs’ head coach, also claimed the Eddie Robinson Award in 2009 when TCU won a Mountain West Conference championship, played in the Fiesta Bowl and finished with a 12-1 record and No. 6 ranking. Patterson was also a finalist for the award in 2003 and 2010. Previous to Patterson, the last Big 12 coach to win the award was Oklahoma State’s Mike Gundy in 2011.